Now that I am home from Australia, I have begun working towards my 2019 health and wellness goals! While most of them have come fairly easily, as I have been excited and ready to make those changes, there’s one that I am still struggling with… Bedtime. Now, I’m going to blame my struggle, over the last week, on jet lag, as Australia is currently an 18 hour difference to Salt Lake City. But honestly… I have always been a bit of a night owl, making an earlier bedtime a challenge. 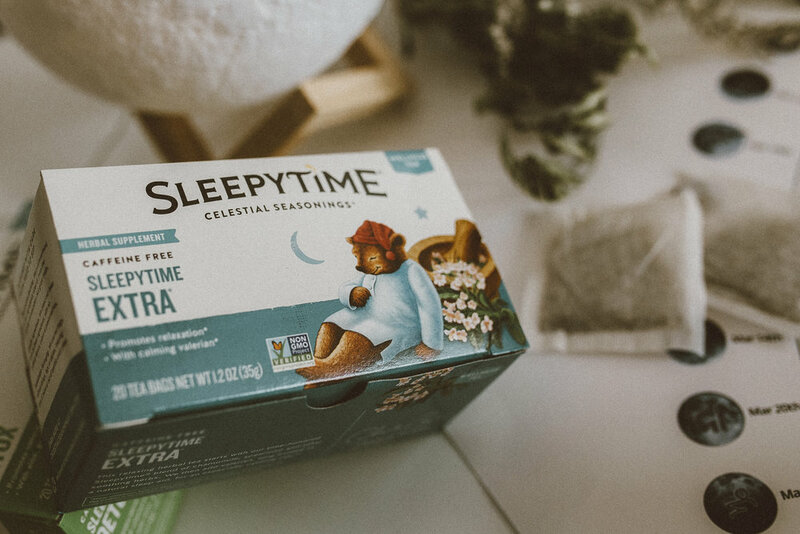 However, I recently implemented the Celestial Seasonings Sleepytime Extra into my nighttime routine, and I swear it is making such a difference! Celestial Teas has a large assortment of flavors, are less expensive than their competitors, and are an excellent and healthier alternative to sugary drinks! One of my favorite aspects of Celestial Teas is their dedication to sustainability! Their tea bags do not have a string and their cardboard boxes are easy to recycle! The teas I’ve been reaching for, lately, are their Sleepytime Teas which are the perfect way to prep for bedtime! My favorite is their Sleepytime Extra, which promotes relaxation. But I also love their Sleepytime Detox (which promotes natural cleansing while you sleep), and their Sleepytime Sinus Soother (which promotes respiratory comfort—perfect for cold and flu season!) All three of these teas are free from caffeine, gluten, and artificial flavors, colors, and preservatives! We’ve all read the studies about how the blue light emitted from screens can disrupt our sleep patterns. So, I am making it a goal to turn all of my screens off an hour before bed, to allow myself time to prepare for the night, ahead. This was a nighttime staple, for me, before social media. Now I’m lucky if I read a couple books a year! So, I’ve made it a goal to do more reading and studying, before I hit the sack. There’s nothing like being able to find the most comfortable position, before drifting off to sleep. I’ve found that doing a little bit of stretching, before climbing into my bed, helps me feel more relaxed and able to find that perfect sleeping pose. I swear having a clean room helps me sleep better! It must have to do with the feng shui of the room, or something… But doing a bit of tidying, before bed, always helps me feel more relaxed. I have always disliked eating, later in the evening. I just find falling asleep on a full stomach to be uncomfortable. So, I have made it a goal to quit eating, each day, by seven o’clock pm. This allows my body time to begin digesting before I turn in. What are some of your goals for 2019? Do they look anything like mine? If so, be sure to add the Celestial Seasonings Sleepytime Teas into your routine! They’re sure to help you sleep better than ever!